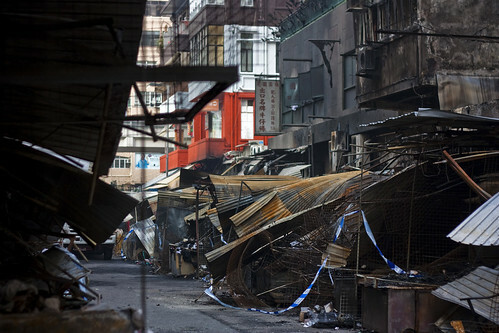 When a blaze in the Fa Yuen Street market killed nine people last November, it was Hong Kong’s street hawkers that took the fall. Even before arson investigators had discovered the source of the fire, the government’s Hawker Control Officers ordered market stalls to remove their awnings and reduce the size of their stock. The Food and Environmental Hygiene Department (FEHD) put forward a series of proposals to reduce the fire risk posed by market stalls. Options include forcing hawkers to dismantle their stalls at night, installing sprinkler systems, moving stalls away from building entrances, relocating street markets away from residential areas and asking hawkers to voluntarily surrender their licences in order to reduce the size of street markets. “It’s like they wanted to blame everything on us,” said Fong Kam-mei, who sells children’s clothing on Fa Yuen Street, at a protest against the crackdown two weeks ago. Many hawkers say the government’s proposals would drive them out of business. Now a group of designers, artists, academics and activists have banded together to improve their situation. “We call it SDU — the Street Design Union,” says artist Kacey Wong, an assistant professor at Polytechnic University’s School of Design. Their goal is to help design a better street market “to improve the hawkers’ business, improve the street market environment and maintain the social and cultural value of markets,” says Chan Ka-hing, chairman of the Hong Kong Design Community. 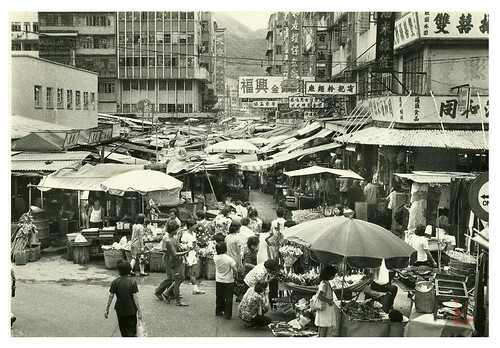 Hong Kong’s hawker policy dates back to the 1970s, when up to 50,000 unregulated vendors made their living on the city’s streets. To accommodate the growing amount of road traffic and to address concerns about hygiene, the colonial government asked hawkers to apply for licences and gave most of them fixed pitches in street markets. It then began a process of elimination by attrition. Hawkers could only transfer their licences to members of their immediate family; if nobody was interested in maintaining the business, the licenced expired. Many hawkers were also rehoused inside government-run market buildings. In other cases, it paid hawkers compensation to give up their licences and leave the trade. The strategy worked as planned. Today, there are 7,500 licenced and 3,000 unlicenced hawkers, compared to 47,000 hawkers in 1984. Since many licenced hawkers are now elderly, they sublet their stalls, which is illegal; according to the government’s regulations, licence holders are supposed to be present in the stall at all times. Hawkers at street markets are given room for a three-by-four-foot booth and 18 extra inches of space in which they can sell their goods. But the allotted space is too small to display many goods, so hawkers often come into conflict with FEHD inspectors, who give them fines if their goods are seen to be obstructing public passage. Inspectors also take issue with the way that hawkers customise their stalls, such as by installing metal awnings and umbrellas to protect them from the sun and rain. But standards do not seem to be consistent throughout the city. Hawkers in Sham Shui Po are allowed more space and greater modifications than in other areas like Central or Mongkok, says Chan, who has been taking photos of street stalls and speaking with hawkers about their concerns. Flower merchants, newspaper vendors and vegetable sellers I have spoken to in Mongkok and Central say that the Hawker Control Officers’ enforcement is arbitrary and inconsistent. One hawker operating near the Mongkok flower market says he often receives fines for obstructing the sidewalk, but other merchants who do the same thing are overlooked by inspectors. “The worst thing is that the FEHD inspector on the morning shift says one thing and the person on the afternoon shift says another,” says Leung Chi-yuen, an instructor at PolyU’s Department of Applied Social Sciences, who studied the working conditions of hawkers. Kacey Wong and other members of the SDU have asked the FEHD to clarify the exact rules to which hawkers are subjected, but they have not received a response. The FEHD wouldn’t give me an answer, either. 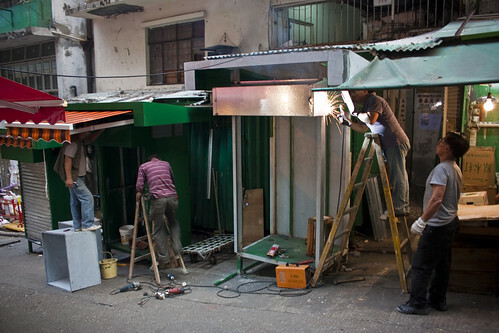 The design of hawker stalls has long fascinated Hong Kong’s designers and architects. “Every stall is different,” says Chan. Tailors, key cutters and watch repairmen often modify their booths so that they can sit inside, while vegetable and fruit sellers, whose goods need more space, ring their booths with containers of produce. Older booths tend to be made of wood while newer ones are metal; some booths are much taller than others. Last year, after consulting street hawkers, the Urban Renewal Authority introduced a range of new stall designs for nine Graham Street merchants displaced by redevelopment works. The metal booths feature shelves and racks that fold outwards, giving their occupants more selling space during the day. But hawkers say that FEHD inspectors have taken issue with the new stalls, preventing them from fully extending their racks, which exceed the 18-inch allotment given to hawkers. They also say the stalls lack enough protection from the rain, forcing them to use umbrellas and tarps to cover their goods, which aren’t allowed by inspectors. If the FEHD confirms its specifications for the size, height and function of market stalls, the SDU plans to launch a design competition and exhibition for market stall designs. He points to the popularity of night markets in Bangkok, where hawkers serve food and young designers, collectors and entrepreneurs gather to sell vintage goods, clothes and handmade objects. This entry was written by Christopher DeWolf , posted on Sunday February 19 2012at 12:02 am , filed under Art and Design, Asia Pacific, Heritage and Preservation, History, Public Space, Society and Culture and tagged Hawkers, Hong Kong, Kowloon, Markets, Mongkok, Policy, Street Markets, Urban Design . Bookmark the permalink . Post a comment below or leave a trackback: Trackback URL. A great site. I was shocked by the depth of your review on this Fa Yuen Street affair, which is seemingly forgotten by most Hong-Kongers, including my very self. The links to other sites seem great too. Will click on them one by one. Thanks for preparing this site.